I bet right now you are sitting in the office or at home, thinking about how it would be possible to work, but also to travel. This is a great opportunity to live your life as a local, to enjoy the everyday life of people in different places that gives an amazing perspective on how you can walk, how you live and how you think in a different environment. It gives an opportunity to develop our minds, skills and business ideas. In general, there are a few ways. The first one is obvious - just take a vacation. Plan a flight, go on your own or take a few friends and enjoy the cities. You have two choices - go on shorter trips (like the typical 1-2-week vacation), so the costs are not going to kill you if you want to enjoy the place to the fullest. Another choice is to go for a longer, e.g. 4-week vacation. However, this can be either costly or not simply possible in your company. The second option is to work remotely. This would be the perfect thing to do if you live alone. Complications start when you think about bringing your partner and/or kids. If your partner cannot work remotely, you can consider not working at all (sometimes it actually makes sense) or being on vacation, however we now go back to square one - sometimes long vacations are not possible, or they don’t make much sense. There is a third option. What if I told you that you can work in a regular company with a nice office, but be able to go to an exotic place for 4 weeks AND be able to work from there AND be able to take your partner with just the cost of a plane ticket AND the accommodation does not cost you a single cent/penny/whatever AND you can go together with your friends from work? That’s what we do, here in AppUnite, a software development company and it’s called WORKATION. This is actually our second workation, you can read about our first workation in Chang Mai, Thailand here and here. AppUnite covers accommodation expenses and half of your ticket price. This year, we started with a simple poll, asking our coworkers: “based on NomadList (so having in mind rational costs of living), choose up to 3 go-to places for this year workation”. The discussion was hot and full of ideas. After a few days the choice was clear - Tenerife. AWESOME! Do you have any idea how big the challenge is to find a house for 8-10 people on Tenerife for half a year? We found out that it was simply impossible, so we moved to the next choice in our poll - Lisbon, Portugal. ALSO AWESOME! A few weeks of searching and we got it. An enormous 5-bedroom house in the suburbs with a swimming pool, a billiard table, a gym and orange trees. A fifteen-minute walk from the ocean. The choice was easy - booked. As a small group of 3 pioneers, we arrived at the airport, rented a tiny Hyundai and moved into the house with a lot of luggage. On the next morning, we were able to experience the full potential of this place - beautiful, quiet and close to the city. Our next plans were simple - work hard and play hard. 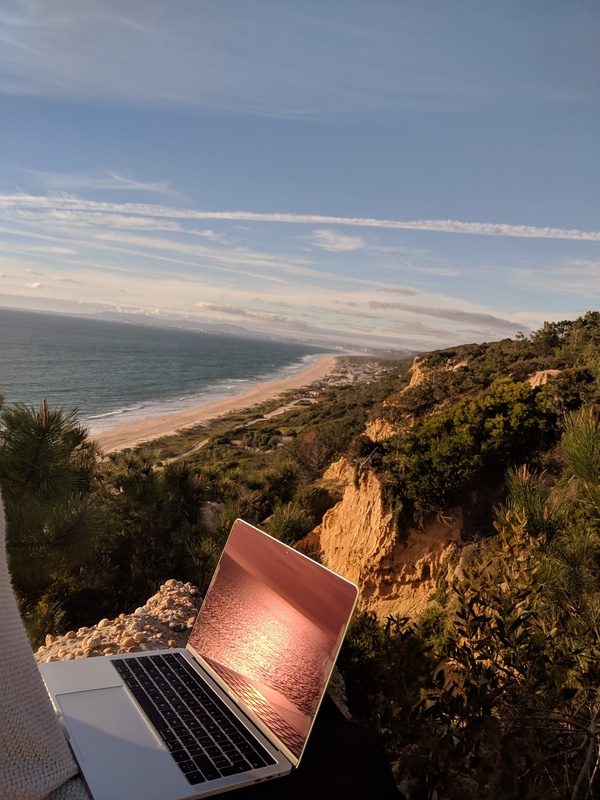 We put all our effort into making the work as good as in the office, which was not an easy task for me personally as a project manager, and live the lives of simple, Portuguese locals to the fullest. Life literally gave us lemons. It is a very individual matter how to make the best of workation. Some people want to travel a lot, some people just want to live like locals and some just want to be there. Workation gives you the possibility to do it the way you like. Just remember, it’s always better to plan something with other residents, as it’s always more fun to do something together. Our plan, together with my fiancée, was to travel and enjoy many faces of Portugal. This required being well-organized. A typical working day was quite simple. You have to book about 8 hours of work to make sure that you are not going to be left behind with anything, and the work goes as planned. The morning routine was absolutely brilliant. You wake up and start preparing some breakfast with coffee, pastel de nata and orange juice from fresh oranges straight from the trees. The morning feels just great. The weather is nice and warm, so you can go out near the pool to hear the birds singing and make yourself comfortable for the start. In the house, there were many workplaces to suit the needs of everybody. Starting from a big table in the dining room (my favourite), to couches in the living room, a private office upstairs and a big table near the pool. It was more than enough for us to have some “private space” and be able to focus. When the work was done, we were usually doing some chillout stuff around the house. Typically hanging out by the pool, reading, watching Netflix or lying on a beach near the ocean. It was a bit too difficult to move around to Lisbon city center as our house was over an hour away from the city. On Friday mornings, our main focus was to get to the city or even beyond it. The adventure usually started 10 minutes from our house. On a bus stop, where we were trying to hitchhike and most of the time with a lot of luck. The road near our house was going straight from the beach (one of the most popular near Lisbon) to the city center. It was easy to catch a ride. If that was not the case, we always had a quite frequent bus that took us to port, so we could jump on a ferry. Within 10 minutes, a ferry was taking us to the sweet spot of the city. Travelling around is effortless, there is only 1 card that you can top up with a few euros to use for any tram, bus, ferry or train. It’s a bit expensive, but totally worth it and allowed us to see a few places around like Sintra or Cascais. For longer distances, like a trip to Fatima, we rented a car. There are many ways to travel, especially when you are in the country and the only thing on your mind is the question “where should I go today’? When the weekend was done, we were going back to our house by bus or Uber to had some rest before a new week. What would be your perfect week? Join us and write your own story. We created a small sum-up video here, so you can see how we spent workation.